I hope you don’t mind my calling you friends? First, I want to thank you all for your thoughtful and sweet comments on the last post “Am I wrong?” Hubby and I’ve been in discussion for the past few days on this subject…well one sided discussion really…me talking and him grinning. I know he’s just trying to rile me, and I thank him for it because it lead to a healthy discussion for us mature gals. In conclusion, I’m too old to stress over the appropriateness of my wardrobe. I promise not to show too much skin or dress too trashy. I hope you’ll be honest, and let me know if you think I’ve crossed the line. That’s what friends are for, right? My Tobi! He’s so wonderful! You always look amazing, classy and chic. 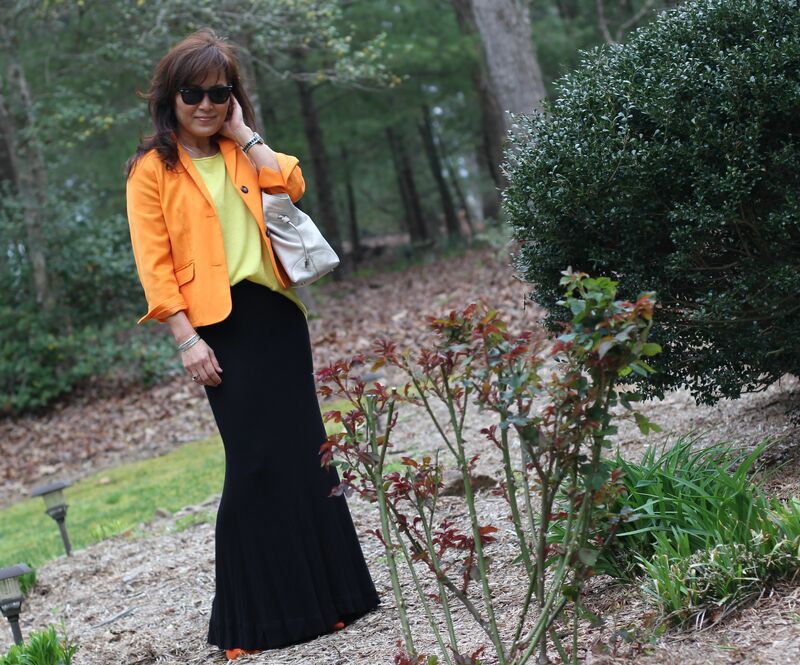 You’re the only blogger I have found around my age that looks fabulous, totally inspiring! I think it has a lot to do with staying in shape, you can’t be out of shape or “pudgy” and look great when dressing youthfully. You have to dress for your shape not your age. Amazing mermaid maxi!! I would live in maxi skirts from now on! Yeah, I love’m, too! Thanks! I’ve been thinking of wearing a black maxi to work. Now I have to, because you look so awesome! Gracefully, I don’t think you could ever look trashy!! Thanks! I’ll try not to shock anyone. I am craving a scoop or two of sherbet after seeing your bright lemon and tangerine outfit. I know, I am a dork. Re: dressing for your age. I do not think you ever, ever cross the line into inappropriate. I have seen women who do and let me tell you, it’s not even debatable that they are dressing way too young and/or way too trashy. I know someone who is 52, wears too tight dresses that barely cover her rear with 4″ pumps and bare legs. That, in my opinion, is inappropriate (maybe even for a 25 year old). You are sometimes classic and conservative and sometimes playful but never dress too young or inappropriate. Sorry that I have not been by to visit you in some time. Life has been getting in the way of my favorite pastime these days but it’s starting to settle down. Yes, I’d like some of what you’re having…two scoops please! I’ve ventured out a bit since blogging…trying new styles that I would normally shy away from. Glad things are slowing down for you. Have a super week! Hi Jeannie! Love the outfit, I think orange looks great on you. I am also enjoying watching your yard evolve from winter to spring. Everything is starting to bloom! 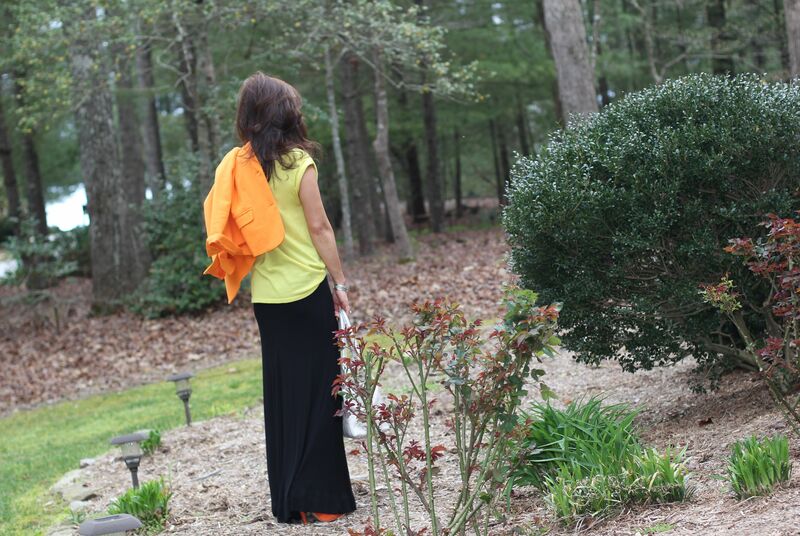 They say orange is THE color this season…yay! I can be fashionable at the ball games now!! I think my favorite is the one where your pooch is running to you. adorable. Beautiful as always. He’s a little hard of hearing, or he might just be ignoring me…but, he loves being around us! 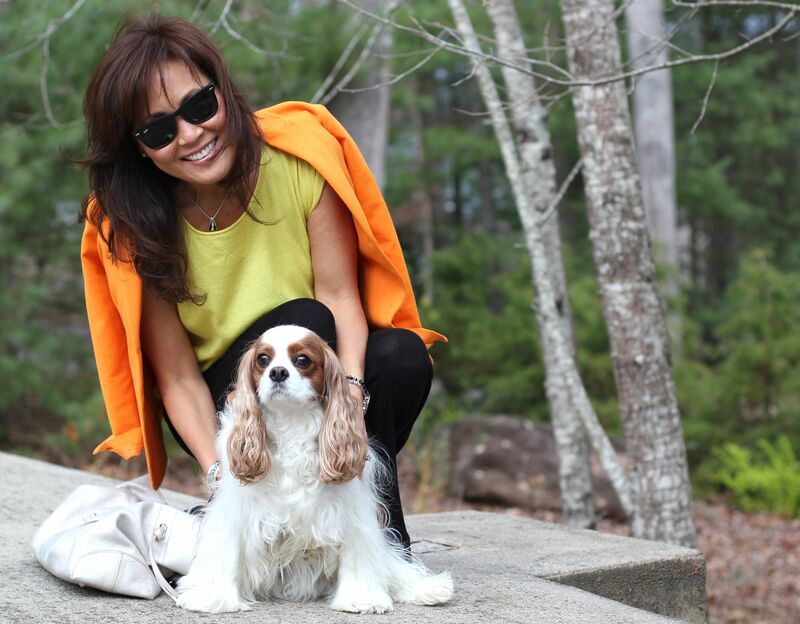 I love the combo of orange and yellow, and I think you dress perfectly – and that while age is something to consider when choosing an outfit, it’s not the ultimate deciding factor. You need to wear clothes that make you feel your best! Pretty as always! I love brights with black…which is good because I have sooo much black!!!! Baby Tobi is the perfect satement piece! Me, too! You should see my closet….at least 70% black! Isn’t Tobi precious? He definitely IS a statement piece! 🙂 Couldn’t live without him. I love the lines of the long black skirt. It looks great and I’ve decided there’s not a color that doesn’t look good on you. 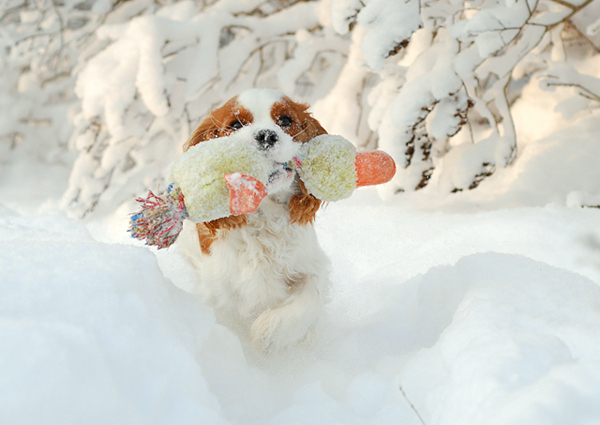 And it’s nice to see your little buddy out playing with you too. Nothing like the love of our dogs. Have a blessed day! 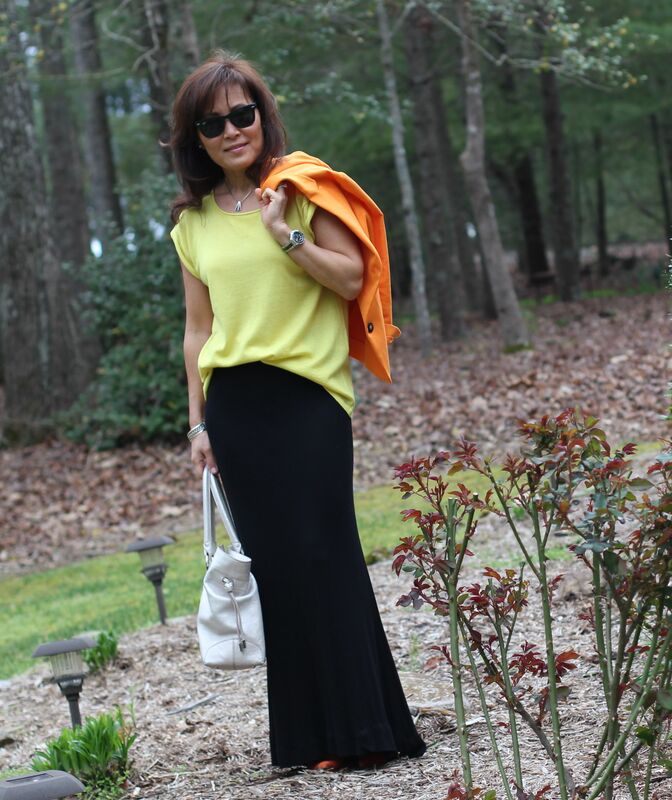 This skirt has been a workhorse for me…so versatile and comfy! Yes, so true! Tobi is my sunshine! Nothing age inappropriate about this outfit ! The colors look good with your complexion. A shorter skirt or even slacks would look great. Yes, I think so, too! Thanks for the suggestion! Hallo friend. Sob Sob I really loved the old you but I love the new you too. Aww…honey, don’t worry…I’m not going all OLD on you! I hope Happy is doing better? tasty fruit salad! and yes – “friends”. the people who live inside my computer are definitely my friends! Thank you! I do consider you my friend…I hope that’s okay? You will tell me if I look stupid, right? Seriously, I’m counting on you! I love putting pops of color with black…especially since I wear so much of it (black) and it tends to make me a cooler shade of death–in fact, I think I have seen dead people in better form. Having beautiful color around the face does anyone a world of good. ~~Bliss (dead people as in at a funeral not like walking around, living under my bed and such–in today’s world, I think it is best to clarify these things). I love black, too! You should see my closet!!! A proposal very nice, funny and cool. A beautiful composition. The skirt is gorgeous. The way you wear the shirt is the best. I think you have not crossed any lines. That every day you teach your friends is the beauty, simplicity and elegance of a woman delightfully mature. I hope not to bother you with my definition. Nice skirt – really like the shape of it. I kinda like it, too. It’s also super soft and comfy…a definite PLUS! Lovely and tres chic darling! The orange is great. Especially like the orange shoes peeking out from under the long skirt. Good work! Yeap! Bring on all things tangerine! Shoes, skirts, dresses…I have several versions of each in the colour to choose from! I think black is a good background for bright colors…don’t you? You are very classy. Love your style. How old is Tobi? He’s a cutie! Very pretty outfit. The silver handbag is a great contrast of color. I love the orange jacket. I keep seeing combos of black and yellow…but I haven’t tried it myself yet. Always before it has reminded me of a bee! And I need to get over that connotation.